This seems like an awkward way to fly. 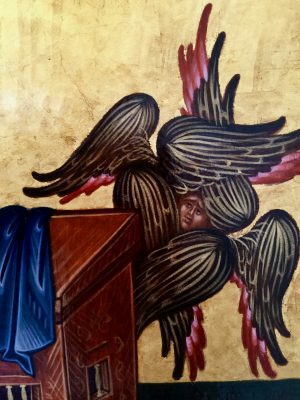 And the face of the Seraph in this icon seems to betray the awkward anxiety inherent in a being which is described as so strong. His eyes seem big, frightened. The Seraphim, a level of angelic beings in Christianity and Judaism which fly around God’s throne crying out “Holy, Holy, Holy” are equated with fire because of the passion with which they encourage the unveiling of God’s Kingdom. This little guy just seems scared, and the awkward, tilting angle of his flight is anything but serene. Scriptures say that these beings cover their face and their feet with four of their wings, but there is some disagreement about the use of the word “feet” in Hebrew scriptures. (Look it up…every time I try to explain it I get into trouble.) Not so much “feet” the words “soft parts” or “vulnerable parts” would be a better translation. As a human with only two hands, I cannot cover my soft, vulnerable parts and still “fly” (move around.) But then I am not a Seraph. I am a human. I walk. I fall. I get tripped. Sometimes even punched. Someone kindly asked me one day what my favorite moment is in the liturgy of the Eucharist. I knew immediately. I love the moment at which we say or sing “Holy. Holy. Holy” with a long, deep, slow bow. Slowly down. Slowly up. I have no doubt liturgists have a fancy name for it. For me, that is where the liturgy is most serene and most electric. It is as if we have stepped into the throne-room, eyes closed, and I am a little bit frightened with awe. It is like placing my face into Caribbean water only to see a whole new world of foreign colors and beautiful beings over a coral reef. Pull my face back, and suddenly I am back in my own world, seeing the watery world again as a blur. Brene Brown is my spiritual advisor and coach. Her words, from audio books, ring in my head as I walk the fields of this farm in New Mexico. She is a source of survival. Her last two books are about surviving trauma and being in wildernesses in which one holds one’s ground no matter what is flung at one. She says we need to face life with vulnerability – the cost of which is very high but the rewards for which are very great. I hope so. I mean I see no other plan, but still, I hope so. She says we need to face life with a soft front, a strong back and a wild heart. She says that a strong front will stop us from being open to the world, unable to let anything out of us as we greet it. I have moved to a farm and live deep into the 20 acres — behind a double padlocked gate. And yet, what I have found is that even that is not safe. We cannot defend ourselves from being hurt. All we can do is try to heal once back behind the gate. Dress the wounds. Staunch the bleeding. Lay down. Rest. Eat ice cream and pie. Try again. They say that the seraphim are equated in both religious traditions with fire because of their inherent passion. They are “on fire” with their passion for God’s Kingdom and their job, in part, is to enflame humanity. It would appear there are no celestial performance evaluations. I would suggest quarterly. But happily, I am not in charge of heaven nor of the celestial throne room. I am just a guy on a farm in a wilderness, trying to get by. But in the end, I do believe that we need, with our wild heart, to have a strong back but a soft front. I hate that it is true, but I think it is. I have seen historical interpreters try to move in medieval steal armor – metal covering every inch of their body. It looks safe, yes. But also, it looks heavy, cumbersome and unwelcoming of a hug. To get a kiss on the forehead, one need take off one’s helmet. To hug, one must remove one’s hands from one’s soft parts, and risk it. I miss your writings when they don’t arrive almost daily but these last two really reached my soul. Thank you!